A. Vincent Siciliano is president, chief executive officer and director of 1st Pacific Bank of California. Siciliano joined the bank in September 2001, 10 months after the bank's opening. Siciliano has over 20 years of commercial banking experience. Of all the banks with local ties, no institution draws from local banking history quite like San Diego Trust. The board and staff combined have more than 450 years of experience in banking San Diegans, significantly more than any other bank in town. This didn't happen by accident -- it was a major part of the strategy of founder and CEO Michael Perry. The $3.8 billion San Diego County Credit Union welcomed Irene Oberbauer as its president and CEO on Aug. 1. Oberbauer most recently served as the credit union's chief operating officer and has worked for SDCCU in a number of other capacities since 1995. George W. Haligowski has served as Imperial Capital Bancorp Inc.'s chairman of the board, president and chief executive officer since inception. He has also served as Imperial Capital Bank's chairman of the board and chief executive office since 1992. Inspired by the national credit union's vision of "People Helping People," Mike Maslak, president and CEO of North Island Credit Union, leads a world-class organization committed to providing world-class financial services, to fulfill the mission of "providing people with the means to achieve their dreams." While Gary Recker may spend some of his free time jamming away on the keyboard in his own home recording studio, his true passion is for the financial markets. As a senior portfolio manager for Northern Trust, Recker develops and manages diversified investment portfolios for affluent individuals and families. Additionally, he oversees a four-member investment team in the company's San Diego office. Bruce A. Ives is the president, chief executive officer and a director of Coronado First Bank. A native San Diegan, Ives, 42, has dedicated himself to a career in the banking industry. As today's business world grows increasingly complex, companies are shifting their focus from competing locally to competing globally. Regardless of their size, a majority of businesses are now maintaining an online presence, working with international markets, and using greater foreign sourcing and offshore production centers. WASHINGTON -- The Federal Reserve and other banking regulators issued special guidance Tuesday urging loan service companies to work with borrowers in danger of defaulting on their home mortgages. Pop quiz: What has done better recently, U.S.-stock funds, or foreign ones? WASHINGTON -- Low-cost lending to financial institutions by the Federal Home Loan Bank system jumped 16.6 percent in August, the system's finance arm said Tuesday. LOS ANGELES -- Ameriquest Mortgage Co., once the nation's largest subprime lender, will close with barely a whimper, after the other assets of its parent company were sold Friday to Citigroup Inc.
LONDON -- Global banking groups could face a 70 percent decline in pretax profits from investment banking and trading in the second half of this year compared with the first, as the credit crunch hits earnings, according to a report Wednesday from ratings agency Standard & Poor's Corp. Retired high-school math teacher Cynthia Elgar often pays her bills online, but when she got a disconnection notice from her Phoenix electric utility, Arizona Public Service, she realized a payment had gone awry somehow. In the past, she would have scooted over to a nearby utility office to make the late payment. When Ben Bernanke was nominated to head the Federal Reserve in 2005, he promised to "maintain continuity with the policies and policy strategies established during the Greenspan years." But in handling his first financial crisis, Bernanke shows signs of a break with Alan Greenspan, the Fed's chairman from 1987 to 2006. The landscape of the San Diego community banking scene continues to evolve. 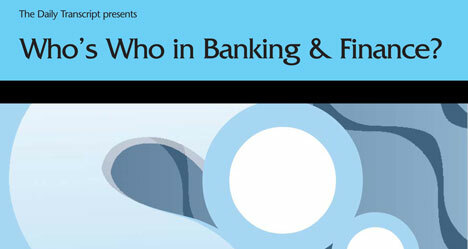 New banks continue to be formed, while others are acquired or merged into larger entities. Amidst all the noise and rhetoric, and despite the highly competitive nature of the San Diego marketplace, one bank in particular continues to outperform - San Diego Trust. Corporate executives and company insiders -- directors, officers and employees who hold more than 10 percent of company equity -- have historically experienced difficulty in trading in company stocks due to the blackout periods established by their companies. Company blackout periods and insider trading restrictions can make it even more difficult for corporate executives to manage their liquidity and find an opportunity to increase or decrease a single-stock exposure. North Island Credit Union has opened a third branch in South San Diego County, offering its members added convenience. Rounding out North Island's presence in the South County, the new EastLake branch is located at 884 EastLake Parkway, Suite 1615, in the Village Walk at EastLake, a new 162,000-square-foot, upscale retail development located within the master-planned community of EastLake. The official grand opening of Village Walk at EastLake will be Sept. 15. There's plenty to think about when it comes to building a home. In less than seven short years, 1st Pacific Bank of California has grown tremendously by serving the needs of the San Diego business community. The bank opened Nov. 17, 2000 with two offices after raising $11.5 million in an initial public offering. With the recently completed merger with Landmark National Bank, 1st Pacific will have assets of nearly $450 million and seven branches located throughout San Diego County. Identity theft is now the No. 1 crime in the United States, with an estimated 8.9 million American consumers reporting that their personal information was used to open fraudulent bank, credit card and utility accounts, obtain loans or commit other crimes. The current mortgage crisis and money marketing woes may lead to consumer spending crunching. However two local banks -- Imperial Capital Bank and San Diego National Bank -- want to assure their customers and the public that they are firmly financed and encouraging prospective commercial and personal loan inquirers to seek them out. San Diego's proximity to the international border puts it squarely on the doorstep of tourism and commerce with Mexico. And, it is also well positioned to benefit from another burgeoning industry: the transfer of money sent home to Mexico and Central America by migrants in the United States.